When the December weather goes from 38 to 70 degrees, but you really, really need to get your holiday fix, we’ve got two words for you: holiday lights. Texas is filled with huge holiday light displays that are an instant cure for the holiday blahs. Here are six of the biggest and brightest. Every year, the Houston Zoo undergoes a wintertime makeover to become a holiday lights attraction the likes of which you’ve never seen — we’re talking 15 miles of lights; a 1958 Cadillac festooned with a musical light show; an enchanted forest; and an interactive, rather chatty zebra. Know before you go: Zoo Lights runs from December 1 through January 15; check out ticket pricing and times here. They don’t call it the Christmas Capital of Texas for nothing, y'all. The much-beloved Light Show Spectacular in Grapevine’s historic downtown features the famed Grapevine Christmas Tree, millions of lights, and more holiday activities than the North Pole. Know before you go: We recommend checking out both of Grapevine’s light parades — the Parade of Lights boasts more than 100 lighted floats and marching bands, while the Twinkle Light Boat Parade takes place on the water and is visible from the shores of Lake Grapevine. If you’d rather keep the kids corralled in the car while you gaze at holiday lights, Santa’s Ranch in New Braunfels is your best bet. For just $22 per vehicle, you’ll cruise through numerous impressive displays, including lit-up nativity scenes, giant gingerbread houses, and even a Christmas dinosaur or two. Know before you go: If you’re not in the mood to sit in traffic, we highly recommend heading to Santa’s Ranch during the week. However, if you’ve become used to traffic after sitting on I-35 for years of your life, check it out anytime through December 31 (Sunday through Thursday, 6 to 10 pm; Friday and Saturday, 6 to 11 pm). 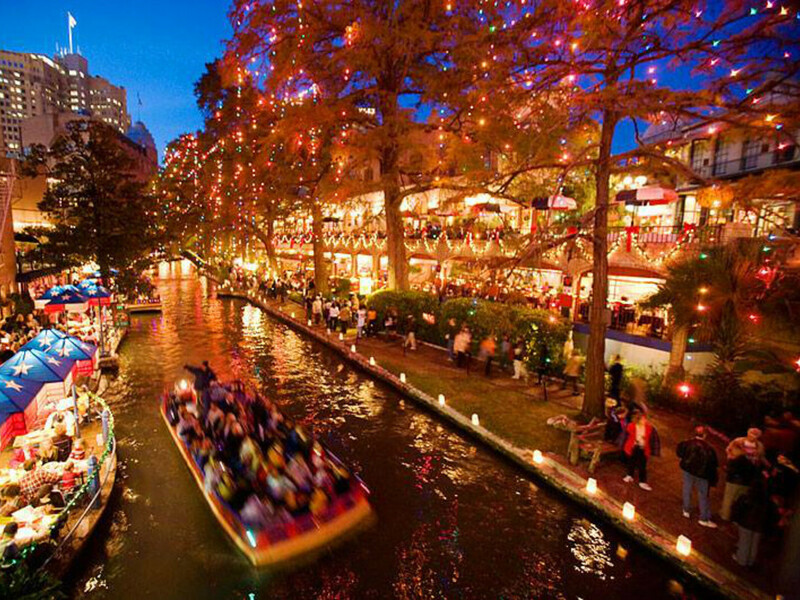 San Antonio’s ever-popular River Walk is also one of the best places in Texas to get into the holiday spirit, thanks to the explosion of lights that drape over every square inch of this area. Now would be the time of year to take a gondola ride up and down the river to properly take in this festive spectacle. Know before you go: This year, the lights will remain on through January 7, starting at 5:30 pm every night. If your idea of a good holiday lights display involves feeling like you’ve stepped into an old-fashioned Christmas card, you’re in luck: the Lights Spectacular in Johnson City is exactly that. Every year (for the last 28), the Blanco County Courthouse and its surrounding trees have sparkled brighter than the night sky, thanks to over 100,000 twinkly white lights. Nearly every home and business in the town square joins in on the action, rendering this one of the loveliest, quaintest spots in the state to enjoy a holiday lights show. Know before you go: The Lights Spectacular runs every weekend through January 2, from 6 to 9 pm. As every good Austinite knows, it isn't really Christmas time until you've taken a leisurely stroll through the city’s Holiday Lights Bonanza 2.0, otherwise known as the Trail of Lights in Zilker Park. The official grand opening this year is scheduled for Saturday, December 9, and the Trail will remain open until December 23. Gather up your crew and take your time strolling through the 2 million lights and 40 displays — just don’t chug eggnog or drink too much spiked hot chocolate before taking a twirl under the Zilker Tree. Know before you go: The Trail of Lights is open from December 9 through December 23, from 7 to 10 pm. General admission is just $3, but there are some free nights as well.